Towards the opening of the Linear Chuo Shinkansen (the Maglev) in 2027, the district embracing Nagoya station is currently in its development process. Step out from the Sakura-dori exit of Nagoya station and you will be surrounded by a group of buildings. 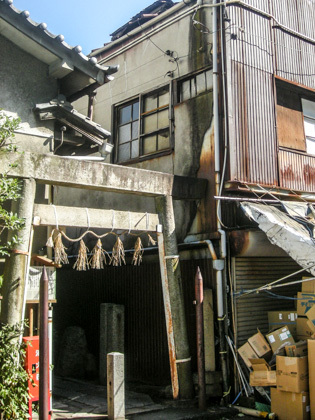 Once you walk through the skyscrapers, an antique old town awaits you. Feel the deep world of Nagoya which attracts people both with its modernity and retro-style ambient, something that makes this town unique. 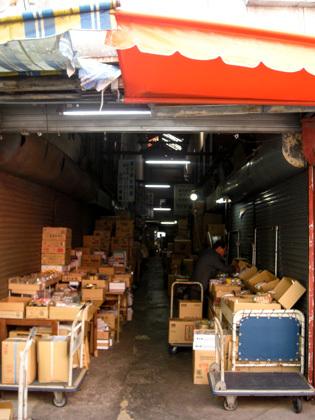 A lot of stores inside the Yanagibashi Central Market and the snack wholesalers prohibit picture taking. Take note that the district is not just for sightseeing but a commercial area where business is transacted. 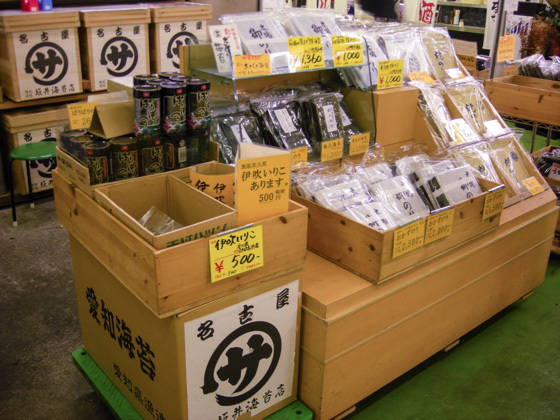 The Yanagibashi Central Market is believed to have its origin in the wholesalers dealing with various products, which naturally developed in the area in the beginning of the 1900s. There are around 300 stores in the entire market and it is said to be the biggest private central market in the country. 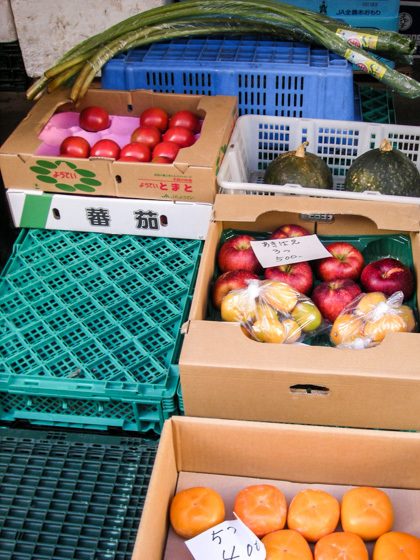 It is uncommon to find this kind of market in the heart of a big city. 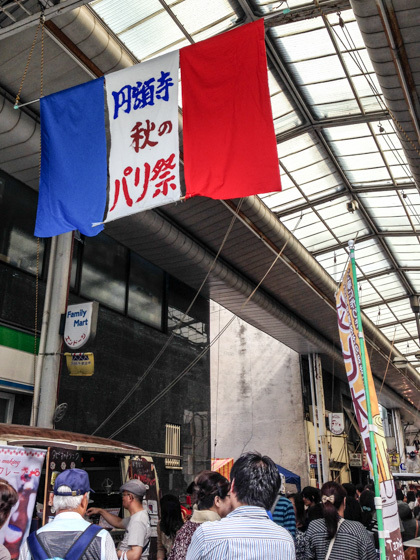 Shops in the market are generally open between 4 a.m. and 10 a.m. The first half of the business hours are dedicated for the professional dealers to work, thus tourists are advised to drop by after 8 a.m. However, some of the stores start tidying up for the day if you go too late. 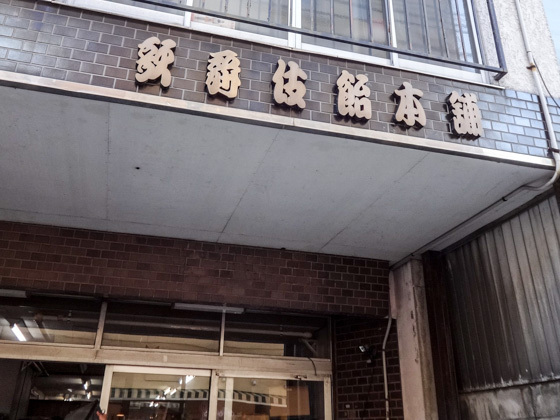 Seafood freshly caught from the Ise Bay and Mikawa Bay, which are located facing Aichi prefecture, and other fresh fish from across the country are sold here, in Yanagibashi Central Market. 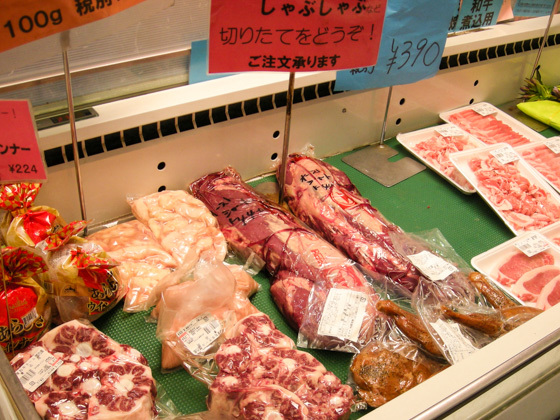 Vegetables, fresh meat, and dried products are also available apart from seafood. 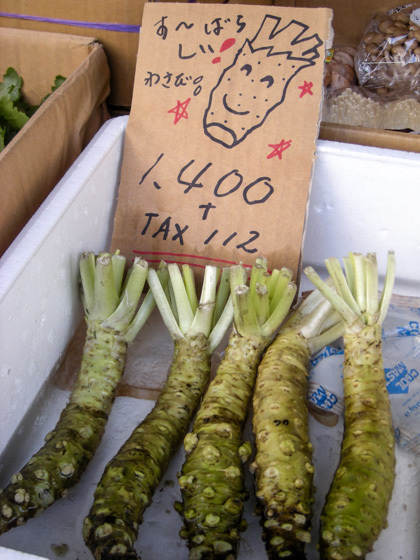 A pop-up advertisement of fresh wasabi at a grocery store. 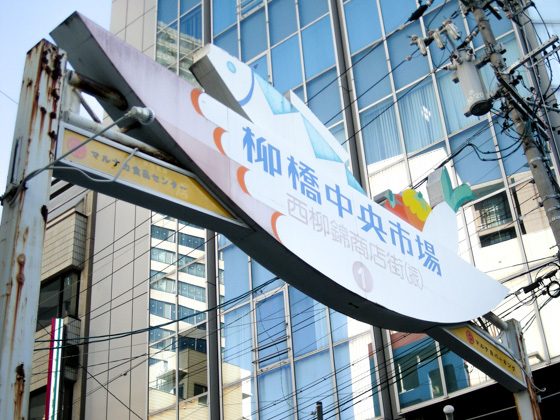 The shop staff started to use these pop-ups to attract tourists from abroad that are increasing lately. 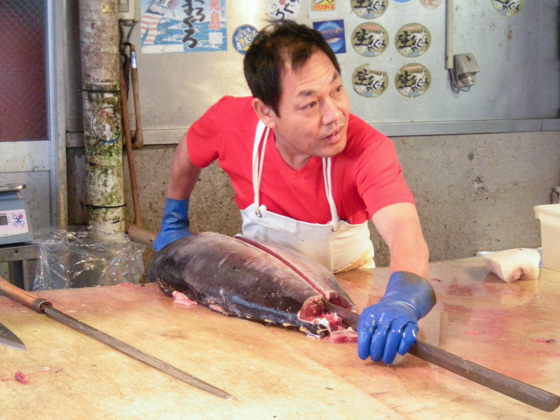 Cutting of Maguro tuna fish. 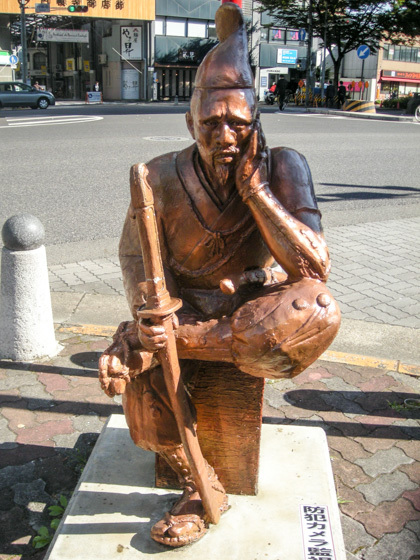 A big sword-like knife is used. 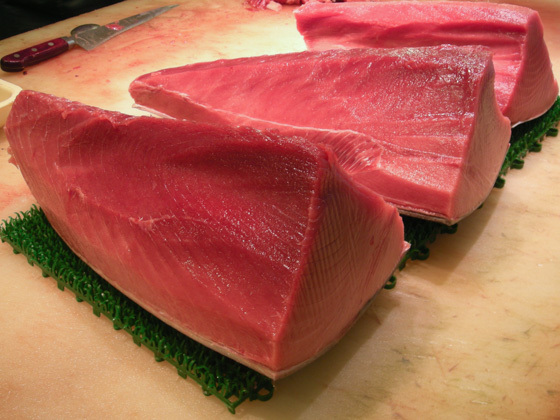 There are some stores where you can observe cutting of tuna between 6 a.m. and past 7 a.m. Since it is not a demonstration show, there is no fixed schedule. Just think you're lucky if you happen to come across with one of the cutting ceremonies coincidentally. 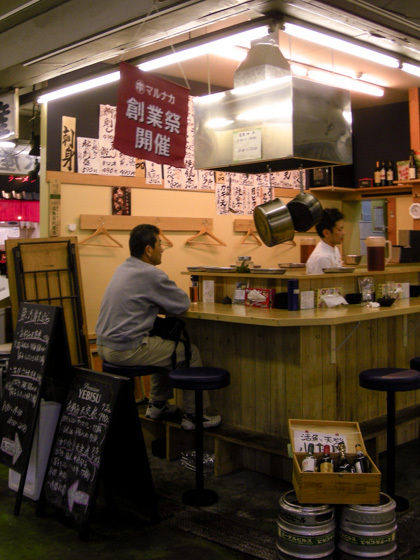 You can also find shops that deal with Unagi (eel). Get a chance to see how speedy the eels are cut. 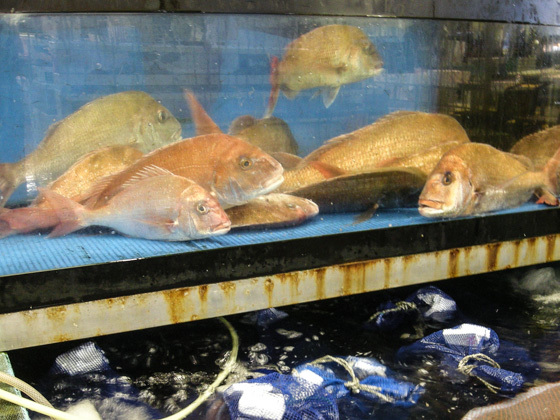 The market is also a perfect place to savor fresh fish and vegetables. 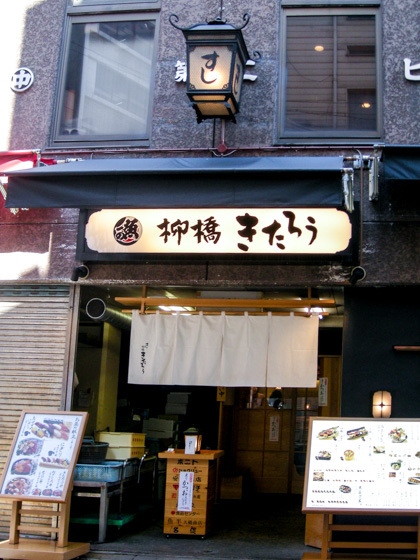 Donburi (rice bowl with toppings) and Ramen noodle shops are available in the area too. The chief cook of Tenpura & Wine Kojima is a professional sommelier. 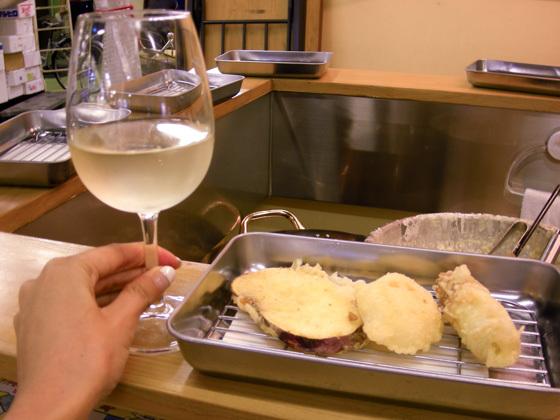 Freshly fried Tenpura and the chef's recommended wine make a perfect match. 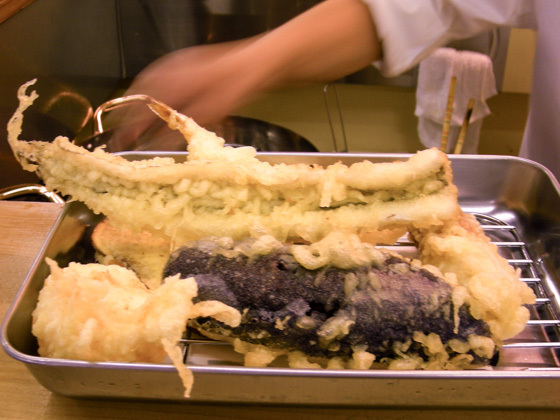 Anago (conger eel) Tenpura which will be served in the Ike-anago-ten Teishoku. The Teishoku series are a combo meal which come together with rice and miso soup. 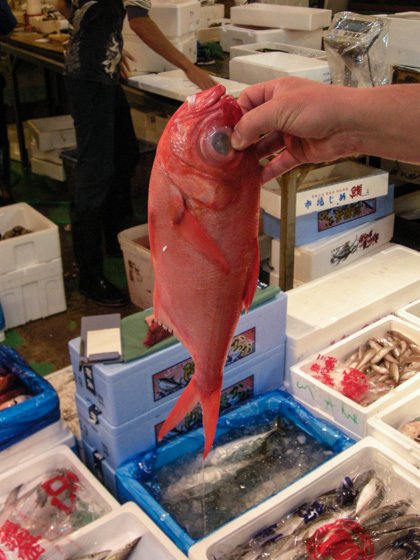 Dishes are available at a reasonable price since the ingredients come directly from the market. 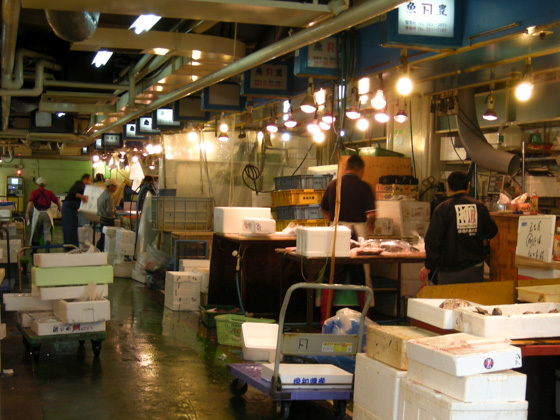 Ninety per cent of the fresh seafood used for sushi and sashimi in this restaurant comes from the market. No reservation accepted during weekdays lunch time. The menu here is non-Japanese friendly showing both the name and photographs of the seafood. (English and Chinese menus available). 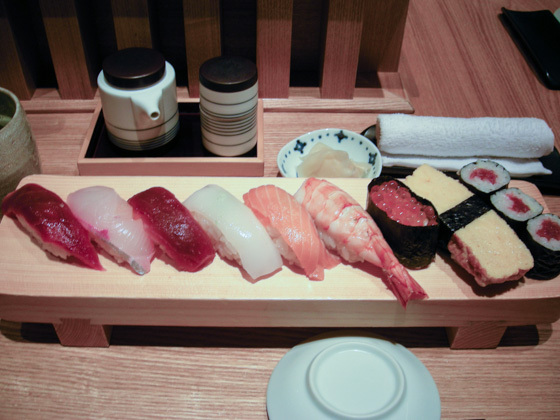 The "Nigiri" lunch set (1,015 yen). 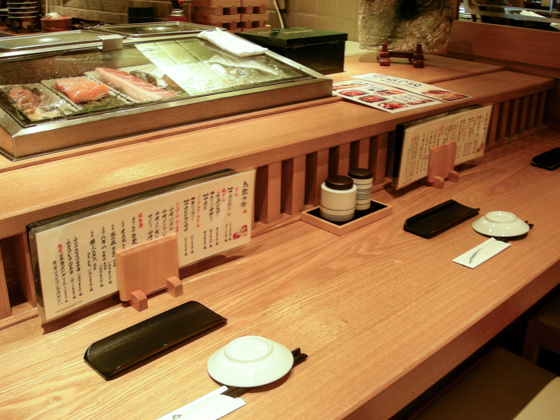 Other lunch options are also available including the Donburi dishes and the chef's recommended Nigiri. 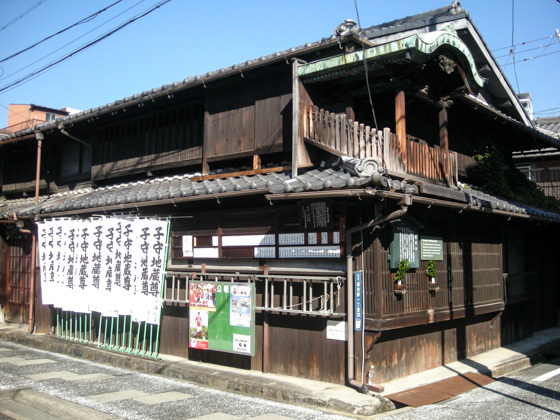 A merchant town which developed after the merchants who lived in Kiyosu, (approx. 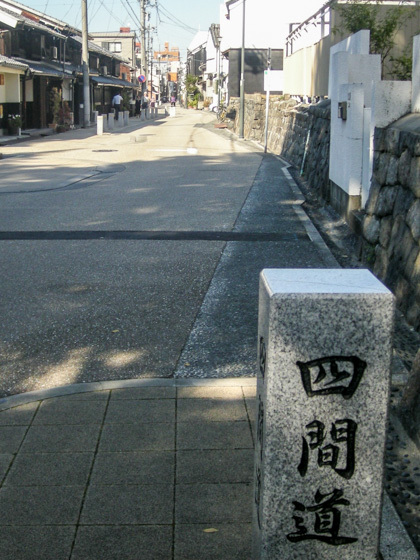 10 minutes by train) the former town center, moved in to this area following the construction of the Nagoya Castle in 1610. 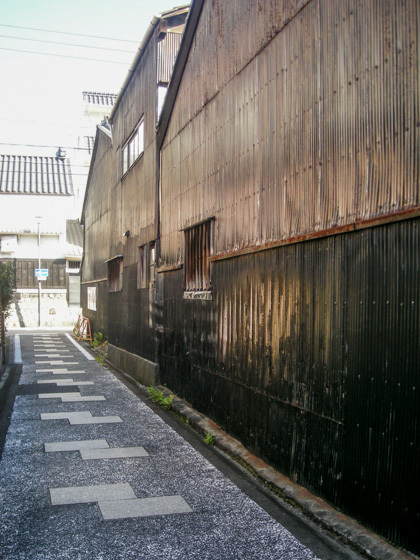 The entire Shikemichi district including the back streets is like a maze. Simply walking around with no fixed plans might let you discover something interesting. 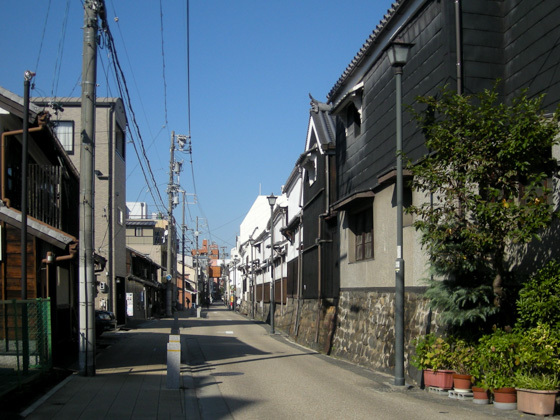 Along the seven-meter wide street, warehouses stand on the east, and the merchant houses on the west. The present view is said to have been formed sometime in 1740. 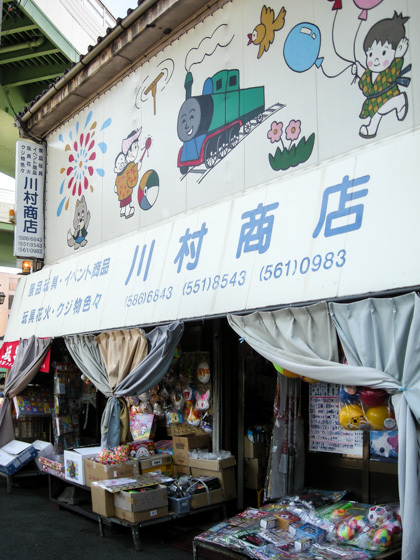 Lately, there are restaurants and stores which sell miscellaneous goods, by making use of the historical architecture in the district. They are drawing attention for creating a fancy and sophisticated town. 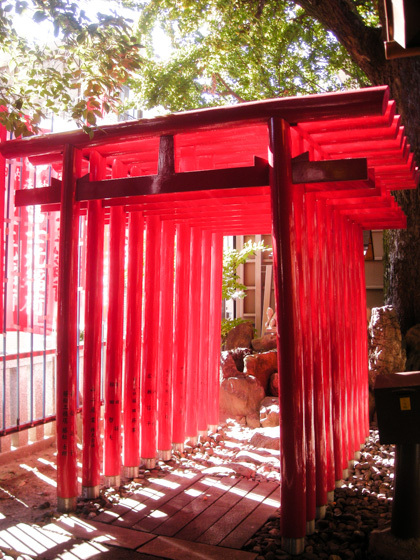 Although the exact year of foundation is unknown, the Sengen Shrine is said to have been re-enshrined in 1647 (Shouhou 4). 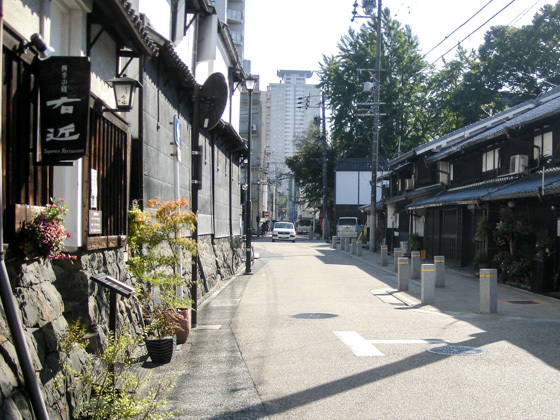 The Kusunoki (camphor tree) and Keyaki (Japanese selkova) trees are more than 300 years old and designated as Nagoya city's preserved trees. 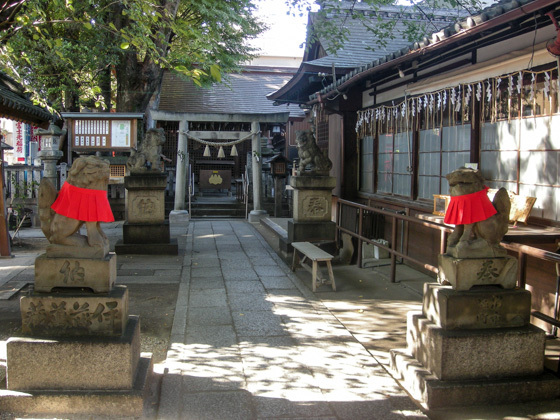 You can also find the Inari (deity) inside the shrine. 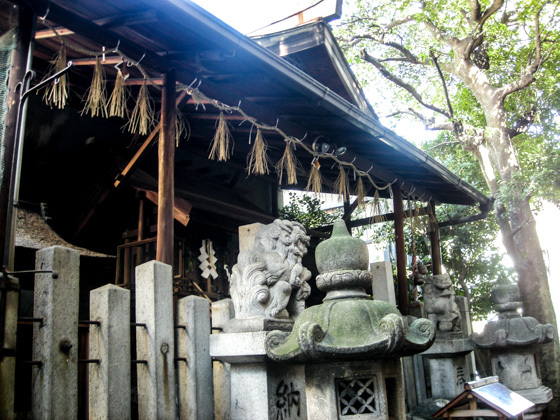 Along the back street of Shikemichi stands an architecture with a shrine miniature on the roof called the "Yanegami", which is something peculiar to Nagoya. It is believed to have been constructed in 1630 (Kannei 7) and remain quietly until today. Business in this shopping street once became slow. Today, it has been revitalized through various activities. The second popular shopping area in Nagoya after the Osu Shopping District. 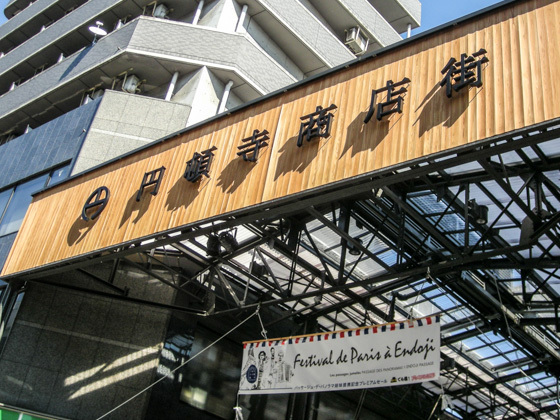 The Paris Festival Nagoya Endoji is held in autumn. 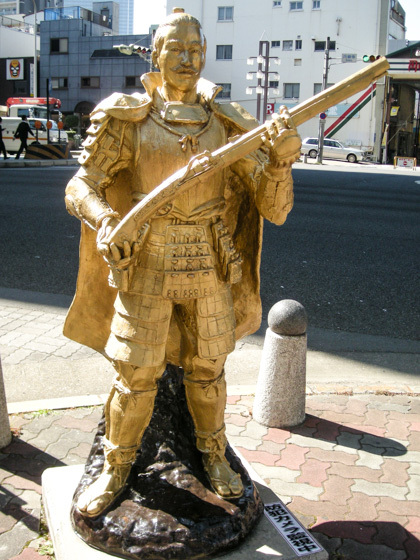 Statues of the San-eiketsu (three heroes in this area) namely Oda Nobunaga, Toyotomi Hideyoshi, and Tokugawa Ieyasu along with Mito Koumon (Tokugawa Mitsukuni), which have been made by individual artists stand at the entrance of the shopping street as a landmark. Don't forget to take a picture with them. 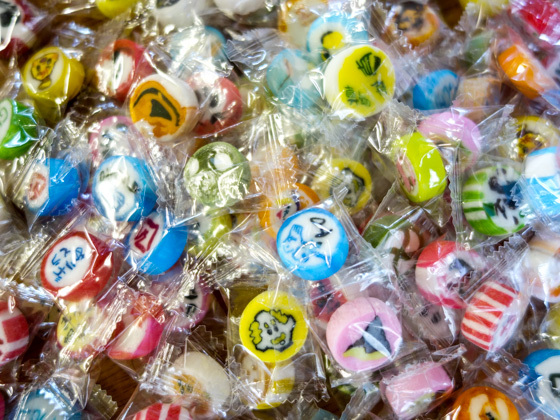 Ever since the Edo period, Nagoya has been famous for manufacture of candies. As housing development progressed in the area, many candy manufacturers transferred to places outside the city. 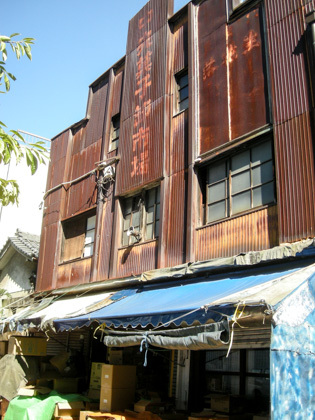 Today, there are only few candy factories in Nagoya, and among them is the Kabuki-ame Honpo. The company building will not be noticed unless you read Kanji (Japanese characters). The factory is inside the building. 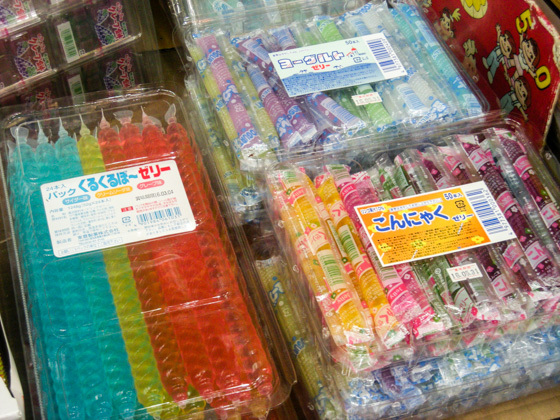 Colorful candies manufactured by Kabuki-ame Honpo. They can be bought directly over the counter at the factory entrance. Open from 8:30 a.m. to 6:00 p.m. every day except for Sundays, public holidays, and every second Saturdays. 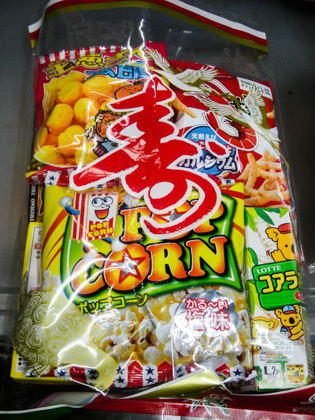 Shin-michi and Meido-cho compose the country's biggest snack wholesale store district. 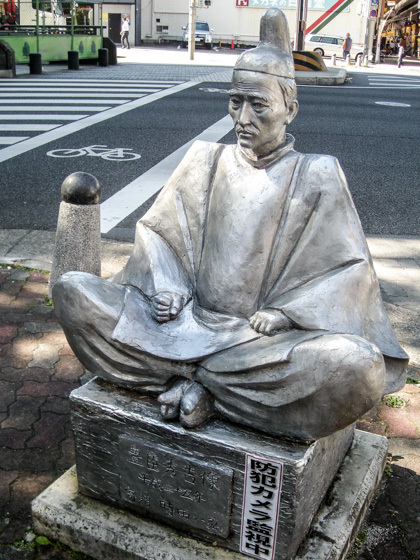 Its origin dates back to when the low-ranking samurai during the Edo period started selling Senbei rice crackers to travelers as a side business. Eventually the area developed into a town known for snacks. 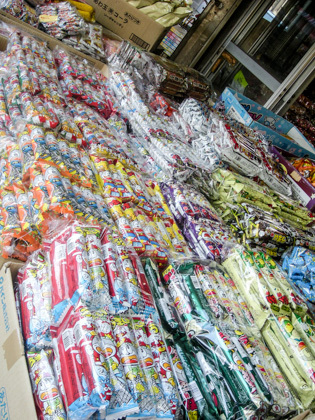 Today, a lot of snack manufacturers and factories still remain here, therefore the wholesalers play an important role. 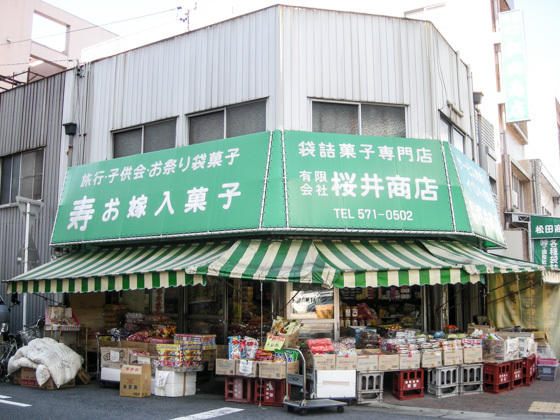 Building which maintains a post-war atmosphere.Ordinary people can buy snacks at a wholesale price. 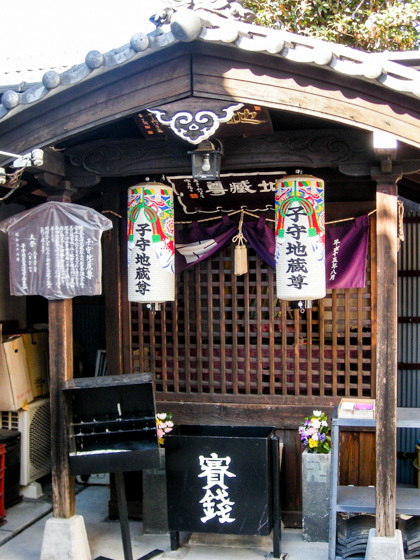 From the very old days, there is a practice called "Kashi-maki" in the Owari region including Nagoya to scatter snacks around in the neighborhood on celebrations. 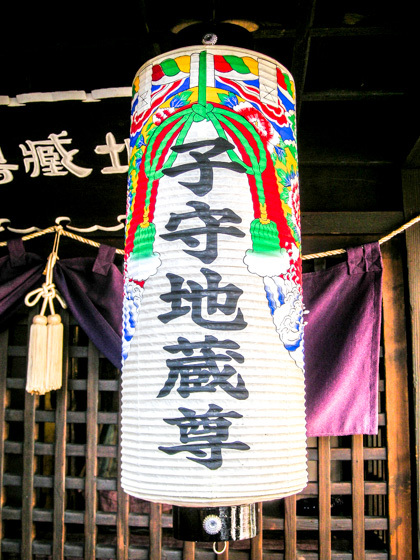 Today, the custom is still followed on weddings and other festivals. 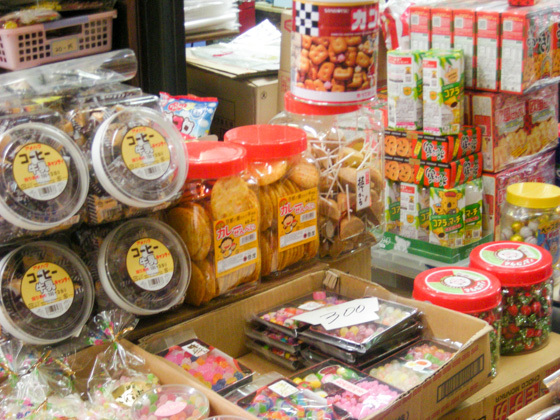 Assorted packed snacks for this occasion are also sold in the district. 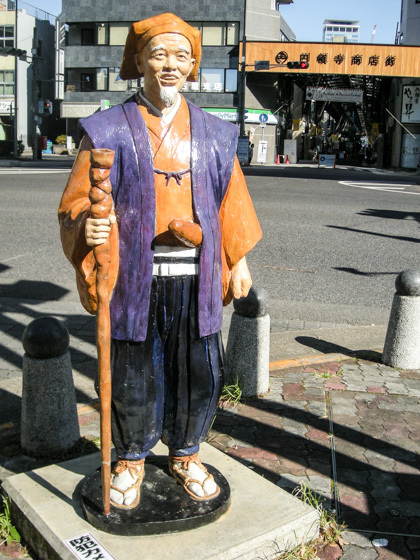 A shrine located in the snack wholesale store district. 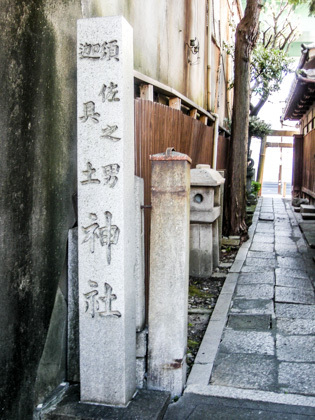 It was founded in 1688 (Genroku 1) and the Susano-ono-okami and the Kagutsuchi-no-okami are enshrined to secure safety and protect us from epidemics. 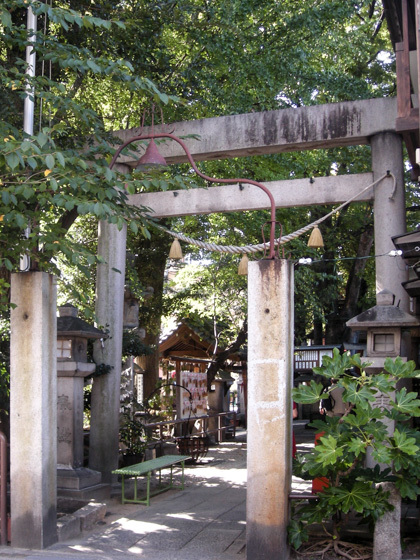 The fact that the shrine is protected only by the shrine parishioners of a single village makes this place also unique. 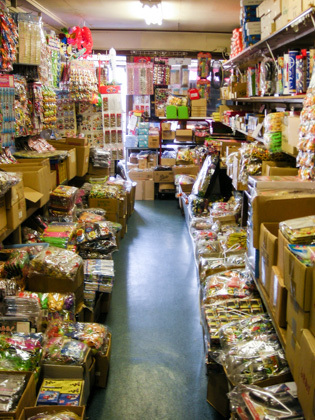 Apart from snacks, there are wholesalers of toys in this area. 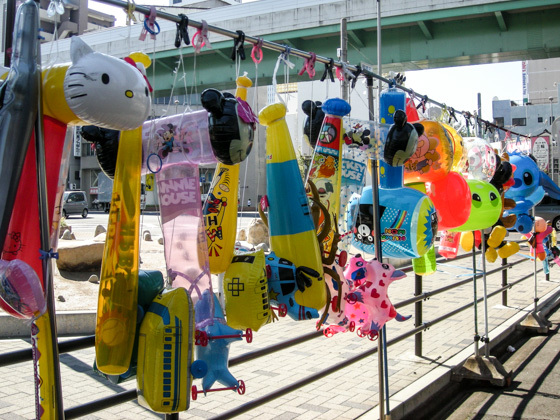 You will find mini air mascots hanged on the fence along the street. Various toys are displayed all over, crowding the busy shop. 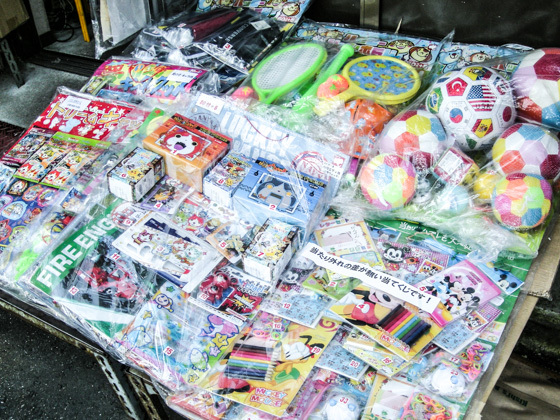 he traditional Kendama, masks, glittering fake accessories, fake guns, and a lot more. 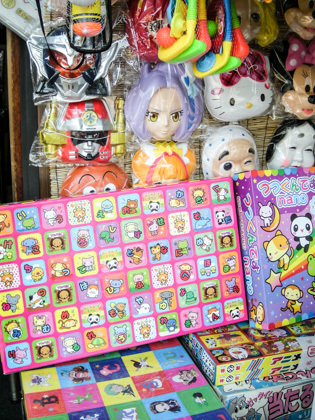 A wide variety and number of toys are available. Customers are mainly professional street vendors, but ordinary people can also buy the products. With many snacks and toys all over, this town is truly a paradise for children! If you are interested in our market tour guide programs, please contact us.